I watched George Carlin’s routine on “Stuff” the other day. If you haven’t seen it, I’d recommend doing a youtube search for it. Much of his work makes you laugh, but it also makes you think, and my thought was, “this winter…” during which there is bound to be some down time, “I will go through all my stuff!” If I see stuff I no longer need, I’ll make other arrangements with it. If it is junk, I’ll throw it out. If it is still useful, I’ll take it to St. Vincent’s ™ or the ReStore ™. “How’s he doing?” You are thinking to yourself. I had decided to start with the file cabinet in the basement. For most of our married life, I’ve kept all the bank statements, credit card statements, receipts from purchases, bills, etc. Each category had it’s hanging folder bursting with stuff. My criteria was going to be, if it is older than 7 years, out it goes. Still, I made myself look at it before I tossed it. It took me an afternoon to get through the top drawer in the file cabinet. I generated a good sized box of paper that no longer fit my 7 year criterium. Why 7 years? I think it has to do with the biblical story of the 7th son of the 7th son, indicating a rare individual. Can you imagine what the mother and grandmother of this rare individual must have looked like? Seven sons in the household, with some assorted daughters sprinkled in for good measure? Those poor women must have been wrecks! This big box sat in the entry way on the table for some time. These documents had sensitive information in them, like the account numbers from banks that have changed names several times since I closed the accounts out. Still, they couldn’t just go into the recycling, so I determined that I’d burn them in the outside burner barrel. I put this off for a while, for a pretty good reason. The old burner barrel is something I walk past all summer, but in the winter, slogging out there is not something to be taken lightly. Besides getting my body out there, I also had to get the box of papers, something to light them with, and a dry place to put the box. Once I figured all that out, I had to sweep out all the snow from the barrel, drop some paper in the bottom, and then get a fire going. Once it started to burn (“Are you sure about this,” Jiminy Cricket whispered in my ear) I dropped a few papers at a time into the fire so things would burn completely. It took some number of hours to get the job done. I now have one drawer of my 4-drawer file cabinet mostly empty. And that, my friends, is about the extent of my project to go through my stuff. Except one further project. The other day I used the last of the bar of soap on the bathroom sink. I started to unwrap a fresh bar, and stopped mid-wrap. You see, for years now, when we finish a bar of soap, we put the left over soap chips in a coffee can under the bathroom sink. There were a lot of soap chips in there. When I queried my brain about a plan for the chips, very little came back to me. So I embarked on a plan to make new bars of soap out of these soap chips, thereby converting some more of my stuff into something useful. The results are interesting. As you can see from the picture, bar one of three is not beautiful. If your nose were nearby, you’d also think the bar smells interesting. 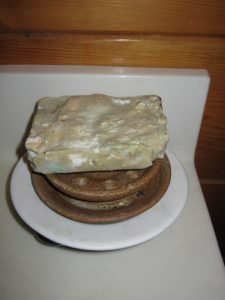 The mixture of decades of soap made a bar that looks a lot like congealed puke, and smells like a freshly opened can of locker room disinfectant. The bar is a little too big in my hands, and it surely does not lather like a freshly opened bar of Ivory ™. But it does work, and I feel a little sense of pride every time I use it. I now understand a little better why we have so much stuff. The pleasure I took from converting some useless stuff into a marginally useful thing was small compared to the pleasure you get when you decide you need something, choose what you want, bring it home, and put it someplace where you’ll find it when you need it. All the trouble of actually putting something to use that has been sitting around for decades provides a smaller amount of pleasure, at least to me. So the stuff piles up. Winter is more than half over, and I haven’t put a dent in my stuff yet. Maybe if I watch George Carlin one more time, I’ll feel better about it. This entry was posted on Sunday, February 4th, 2018 at 8:08 pm and is filed under Uncategorized. You can follow any responses to this entry through the RSS 2.0 feed. You can leave a response, or trackback from your own site.